Hello stamping friends. Welcome to this months Stamp to Share International Design Team Blog Hop. 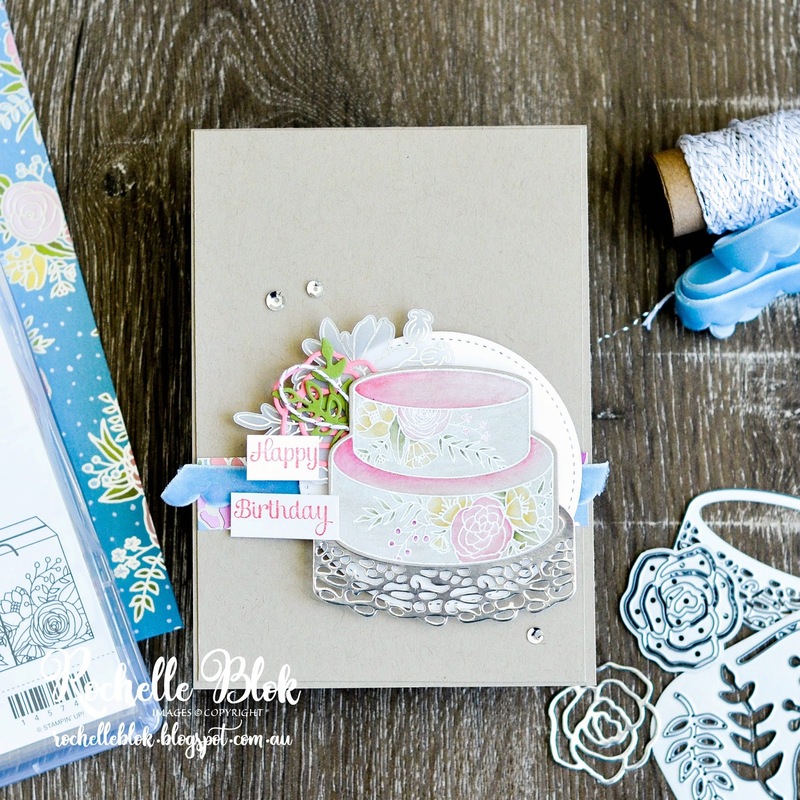 We are bringing you our creations using the Cake Soiree Bundle. It's everything pretty, girly, gorgeous and all things that I love! The products from the Sweet Soiree Suite were the first ones that I had to have from the 2018 Occasions Catalogue and have really loved creating with them so far. Today I've gone with Crumb cake as my bas colour and then build up my card from there. 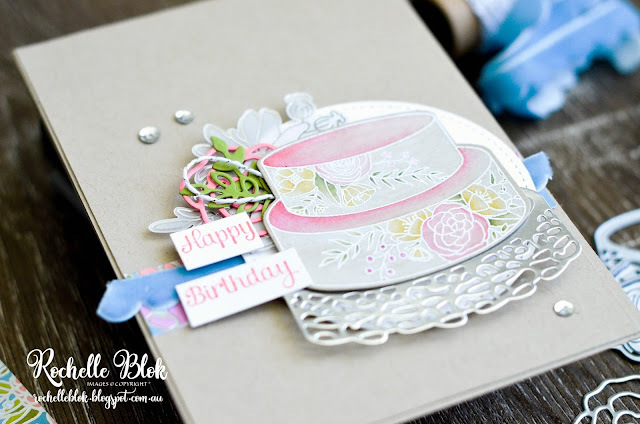 I first stamped and embossed the cake with White Stampin' Emboss Powder and then washed over the cake a wash of Whisper White Craft Ink on top of the Crumb Cake using an Aqua Painter. I made sure not to use too much water when putting down the white ink so as not to pill the Crumb Cake Card stock. This white ink acts as a protective layer when colouring on the Crumb Cake cardstock but you still have to be careful not to use too much water. I've then coloured in the cake with colours that are found in the Sweet Soiree Embellishment kit - Flirty Flamingo, Old Olive, Daffodil Delight and Berry Burst. The white wash of the cake and the colouring in of the flowers make it look like the flowers have been painted on the cake and the images have been piped on with white icing. All the things that make a gorgeous and beautiful cake. To the side of the cake I've layered some pieces from the co-ordinating Thinlits Die set - Sweet Cake and as well from the Sweet Soiree Embellishment Kit. Again using the same colours that I used to colour in the cake. 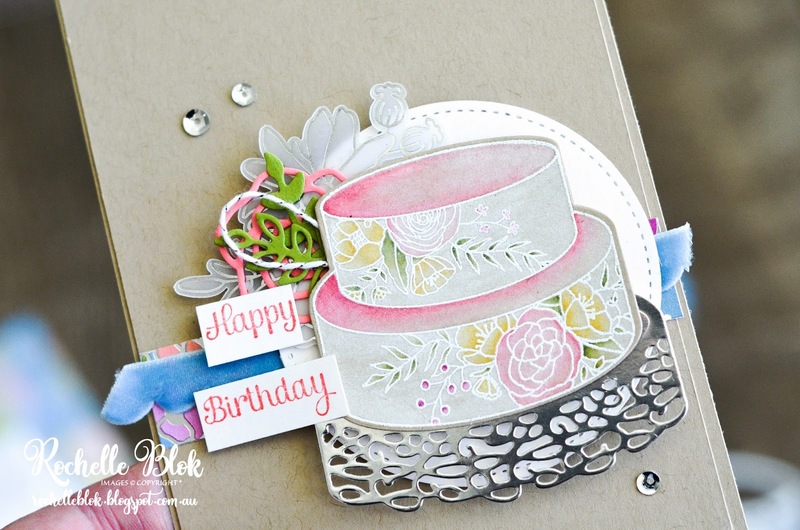 Love that consistency of colours throughout the card used from the embellishment kit. Consistency and co-ordination is the key! Under the cake I've layered a piece of the beautiful Sweet Soiree Specialty Designer Series Paper and a piece of the Marina Mist Scalloped Velvet Ribbon, from the embellishment kit. If I was you I would get the embellishment kit just for that ribbon. Its A-MA-ZING!!! I think Stampin' Up! need to bring that ribbon out in a full roll of it. Saying it is beautiful is an understatement!!! And then I've finished the card of with cutting out the 'Happy Birthday' from one of the sentiments from the Cake Soiree Stamp set and then dotting a few Silver Sequins around on the card for that little something extra and that gorgeous touch of bling! I hope that I've give you some inspiration with this bundle and suite and some more ideas on how to use these products. Now back to the top of the hop with Amy Koenders in the U.S.
Just beautiful Rochelle! I love your layering and the soft colors are perfect. Great design! WOW just so beautiful, Rochelle :) ! Love the colors and your amazing style, it's so perfect! What a beautiful cake! It really does look like fondant ~ And your ribbon looks awesome. 'Something blue' for the wedding! What a beautiful card. Love, love all the details in those layers!